I finally got to demo backcountry skis this past weekend and generally liked them better than regular skinny skate skis like they use for competitions because I like exploring off trail. However, I had regular (NNN, I think) bindings and I still felt like I could use more heel control upon turns as my feet would pivot around the binding clip in the front as that is the only point of attachment between the foot and the ski. Then I saw a lady that had skis as wide as mine and with a steel edge but she had telemark style bindings with a harness going around her heel and I think her toes didn't clip in but were just pressure gripped to the front part of the binding. At first sight, it looked like that kind of binding would give me the heel support and control upon turning and in deeper snow. Of course, that system requires a different boot. I would like to hear some more aspects of this telemark style binding vs the one I was using (front clip or NNN). SOMEWHAT RELATED: Why don't XC skis have edges? It isn't the bindings that give you the control you're looking for as much as it is the boot. What you're looking at here is the crossover from old-school to new-school technology. Telemarks with the toe bails and heel cables have been around forever. The cables reduce heel friction, and do offer more down hill control, but there are newer technologies out there that pretty much render telemarking obsolete. You're talking more about the culture of skiing when you start talking about telemarking than you are about superior technology. Telemarks were the backcountry ski of choice for many years, but AT skiing is quickly overtaking it on the Alpine skiing scene, and NNN and SNS have been dominating the X-country scene for years already because they are lighter, easier to use, don't ball up with snow and ice, and are cheaper, leaving Telemark as a kind of niche sport with a strong cult following. But even telemark is evolving more into AT, you'll notice that the telemark boots on the far right in the picture below are also dynafit compatible, so you could use those boots with both telemark or AT bindings. As you can see from the image above the two styles of skiing both have their extremes but also share some middle ground. If you're just getting into it, and want to invest in new gear, I would seriously recommend going with an AT setup if the type of backcountry skiing you want to do is going to be mostly looking for an untouched slope to ski down, but if you're more interested in long tours, but want more control, then go with a beefier SNS setup like the one pictured second from the left above. 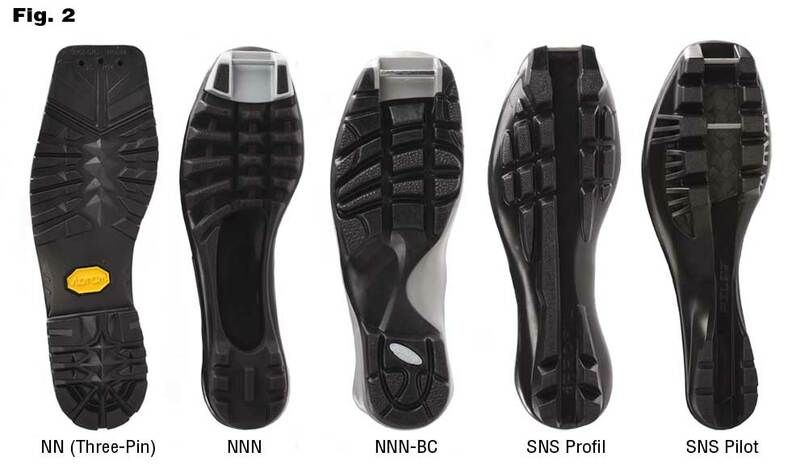 I personally am partial to the SNS system over the NNN system, because they have a deeper heel grove that offers more heel control in my opinion, even more so with the SNS pilot. Your other option is to demo some more gear, or pick something up second hand, I typically try a new sport out first on used cheap gear, then if I really like it, save up and invest in something good. We live in a day and age where there are lots of technologies that favour slightly different styles. So who knows, maybe you're a tele-groupie and just don't know it yet and telemark is the direction you want to go. There are still newer technologies coming out for telemarking, like the NTN binding system, and I hear they're developing hydraulic knee braces that allow telemarker's legs to last almost as long as AT skiers on the slopes (jokes, telemarkers will always burn their legs out way faster than ATers). While you can get an AT setup that will work on "backcountry" skis, you'll need to spend somewhere in the range of $1000 for boots and bindings, and unless you are skiing terrain that is similar to a downhill resort, it will be a very awkward setup with the mode switching that AT gear requires. The type of ski and skiing mentioned in the original question is often referred to as the "holy grail" among people interested in this kind of stuff. I've spent 30 years trying many various combinations of boots and bindings and all of them work and all of them have serious drawbacks. Any boot that is light and flexible enough to make kick'n'glide fun on flat and gentle sloping ground is going to make turning on steeper and icier ground difficult. Any boot/binding that provides enough support for turning skinny skis is going to be a dog on the flat ground. You have to pick your poison. I find that I have the most fun when boot, binding and ski are roughly balanced. Putting a burley boot on a light ski or light boots on a burley ski can work, but it just isn't that much fun. The advice I always give is to pick the boot first, and then pick the binding that works with that boot. How well a light boot fits is by far and away the most important factor in turning light skis with light boots. If you can find an SNS or NNN/BC boot that gives you a snug ski boot like fit, (no heel movement when you flex the boot), then that's the boot you should get. If you find a 75mm light boot that fits you well, then 3pins would be an appropriate choice. The market for lightweight 75mm gear has shrunk significantly in the last 5 years or so, there aren't that many choices anymore. I haven't been that impressed by current offerings for SNS or NNN/BC boots, they are all pretty heavy and don't offer much extra control for the weight. I would take a serious look at XC combi boots ( i.e. skate and classic combo boots ) for at least the skinner end of the "backcountry" ski range of skis. It would be very helpful to this question if you could list the dimensions of the skis you are looking at ( width at tip/middle/tail ) and the typical terrain you want to ski. Not the answer you're looking for? Browse other questions tagged cross-country-skiing or ask your own question.